You can put any information into header or footer of the future copies, and page number is just a sample. If you type &w&bPage &p of &P macro code as a header format, it will add text like “Page 1 of 10” into the header of each PDF copy page. You can simply type &p, and your header will display only the count of current page, like 1,2,3, etc. Footer is editable in the same way. 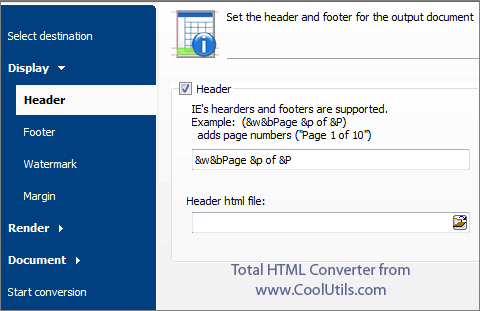 Besides setting a text template, you can upload header or footer from the external HTML file. Total HTML Converter has a lot of useful options for HTML to PDF export. For instance, it supports selective conversion of only texts or only images. With its help you can also make a one-color background for PDF copies or use uploaded image as a background. PDF files can be encrypted or signed with digital signature for better security. Test Total HTML Converter in trial version that has all features of licensed program. nice to hear that. you have the awesome resource! Is there a way to convert PDF to TIF and add a page counter? Is there a way to convert PDF to TIF and add a page counter? I’d appreciate this option.